So a third sley and the sett is now 28 epi and now only some were grabbing each other where they were in the same dent and the tension was all screwy on the left hand side. I also really didn't like the way the warp threads were bunching up and producing very heavy reed marks. So I sat and considered my investment of time and yarn: its been threaded twice, I fixed two threading errors, resleyed three times and its still not resolved. I wanted to have this project on, woven up and off the loom before I went for my surgery the end of September. The goal was to be able to hand sew the hems while I recovered. 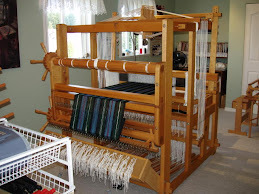 I also wanted to get a new warp on the loom so it was all set and ready to weave when I was ready to get back in the game. So out came the scissors.... Yup, all of it, in the garbage. No regrets. So I adjusted the project to work with 10/2 cotton and got busy winding a warp of natural colour mercerized cotton. Bruce helped me wind on the eleven yards. This time everything went just right! There were no threading errors, no sleying errors, nice even warp tension and the 24 epi sett worked beautifully. Virginia West's classic book "Finishing Touches for the Handweaver" This book is a real treasure if you wish to have your work beautifully finished. It was a game changer for me when I got my copy nearly twenty years ago! I had purchased some cones of yarn in a series of soft neutral colours in a fine bamboo (6300 yds/lb) and decided to use them as my weft. The Bambu 12 is soft, has a great sheen and and would give the towels a lovely hand. They would be naturally anti microbial and anti fungal which is a nice property to have in a small towels that might sit wet after hand washing. 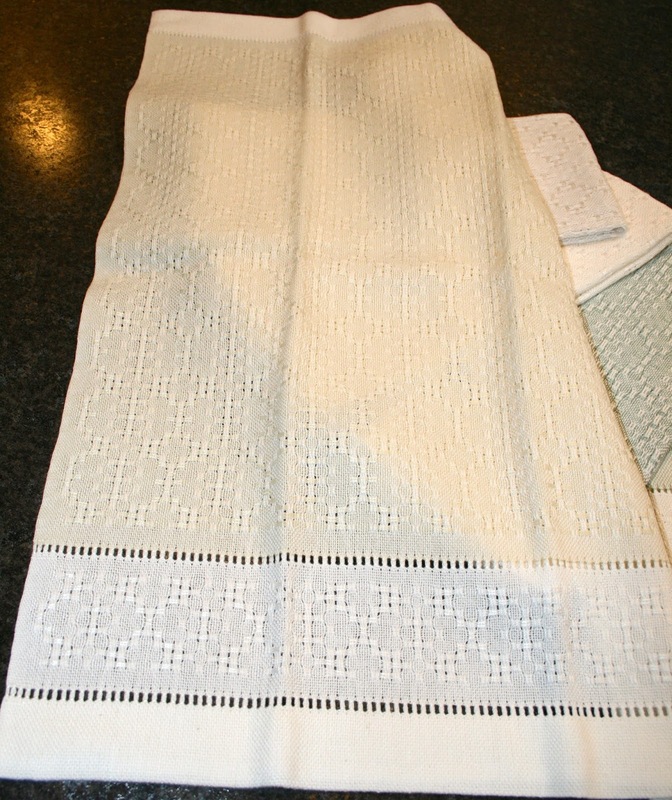 I'm weaving an eight shaft huck lace that makes a repeating diamond pattern. Its something I had played around with in my Fiberworks program. I planned to make half the towels with the diamond motif and the other half would have a design I'm calling lattice and flower. I played around with the treadling options to find a pleasing pattern. So that was five rows of hemstitching per towel and over a dozen towels that totals 60 rows altogether. What the heck was I thinking?? Do a fast project and get it off the loom and reloaded before my surgery date??? I also had to warp up and load the Megado and then we decided to re-assemble the tapestry loom over leaving it as a pile of lumber on the floor. Timing was going to be tight! The tapestry loom was re-built, and the Megado loaded. That would be the first choice of loom to weave on thanks to the one treadle and light action so it made sense to get it done first. After that, I worked away on the towels and got my speed in hemstitching up to new world record speeds! It was tight for time but the warp came off and a new one went on the same day which also included being hoisted up on crates to change the tie up! I measured and pressed the hems and pinned them . It was a nice stack of hand work waiting for my return! Then, I indulged in a studio cleanup too which I must admit felt real good. My creative work space was all set for when I would be ready. Anaesthesia does funny things to your head. It makes you fuzzy minded and clumsy for a time. Its surprising how long it lasts in your system. Then there's the pain meds after surgery which add their own complexity to the mix. I guess it was nearly 3 weeks after my surgery that I was interested enough to try sewing hems. The cloth was quite fine so good light was necessary but I slowly inched my way across one hem after another. Last week I placed them into a gentle wash cycle and once spun out, I trimmed off any tails and let them line dry over night. Next morning I lowered the ironing board and pulled up a chair. I steamed pressed them and I'm very happy with them! I found only one that had a treadling error, which we politely call a second. They measure thirteen inches wide by nineteen and a half inches in length. The colours are a soft butter yellow, green tea green, snowy white, a light beige called water chestnut, and a blue green. The sheen from the bamboo is lovely and the fine cloth has a nice weight to it. If we do get a bright sunny day, I might try re-photographing them, but this will have to do until then. So this project was all woven before my surgery (on a wonky knee no less) and I'm happy to report that I have made a start on trying to weave again this past week at six weeks post operative! I did do some work on the Megado, where I used mainly my right leg for 30-40 treadlings then I would do 10-15 with my left leg and so on. I took the next day off to see how it felt and it was fine. In the case of this treadling plan there is an even division between left and right leg so they both got an equal workout. It didn't feel too bad at all! I did only two repeats. My physiotherapist has given me the go ahead to weave and called it a "great quad strengthening exercise" and asked if I had a spinning wheel too? I said yes and she she told me it was okay to use it as well! I'm not 100 % as yet and still a lot of inner healing and more exercises to go, but I feel like I'm finally on the way back!